Finding the Best Beach Carts with Big Wheels is easier than you think. Here’s a rundown of our top five picks that can handle beach terrain, including our top pick - the TimberRidge Folding Wagon/Cart. Family outings to the beach are made simple with the help of a beach cart. A beach cart, equipped with big wheels to tackle any terrain, is just what beach-goers need to transport all of their accessories. From lounge chairs and coolers to towels and beach toys, the right size cart can make hauling the essentials a breeze. 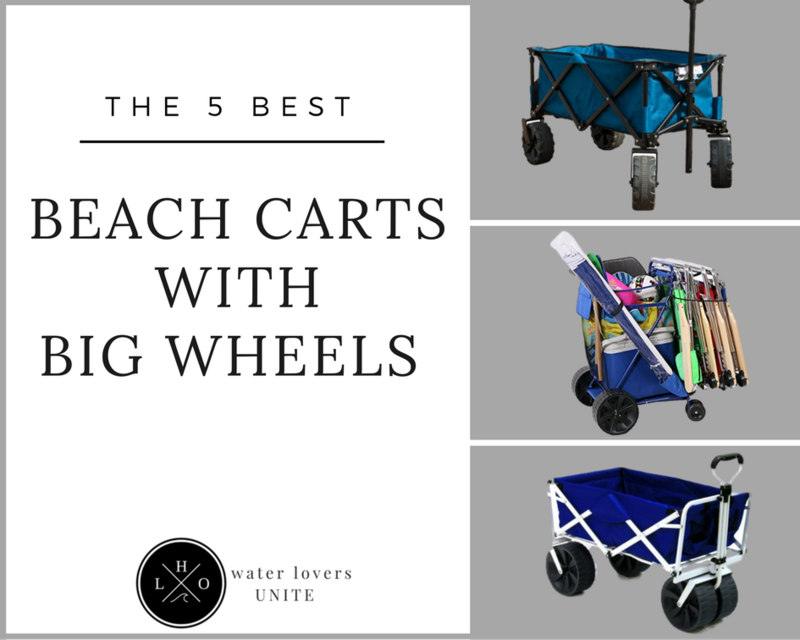 If you’re itching for a trip to the beach, you may be on the search for the best beach carts with big wheels. To see which carts stand up to the heat, sand, and water, we put five beach carts to the test. Each of these tested carts feature big wheels, which we consider an essential feature for traveling over grass, pavement, and sand. Here you’ll find some of the key features we recommend looking for in a beach cart, and our top choices for best beach carts with big wheels. Frame Durability: The frame is one of the most important aspects of a beach cart. You need the frame to be highly durable and rust-resistant. Many beach carts are constructed of a combination of aluminum and stainless steel. Easy Storage: When not in use, it’s great to be able to fold up your beach cart. You’ll also want to be able to easily fit the cart into the trunk or back of your vehicle during transport. 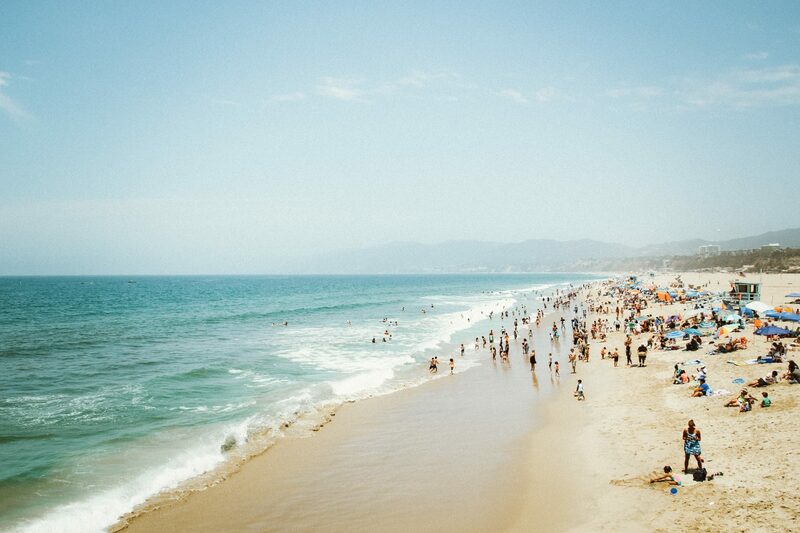 Cleanable Fabric: While at the beach, your beach cart will likely be covered in dirt and water. 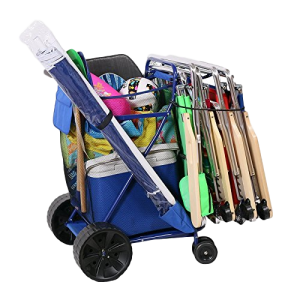 You will want to choose a cart that has a fabric that can be easily cleaned and dried quickly. Useful Pockets: While not essential, having extra pockets in your beach cart can be extremely useful. Large pockets can be used to hold small accessories, such as suntan lotion or sunglasses. TimberRidge is known for providing consumers with professional outdoor tools and accessories. In addition to providing essentials like tents and bags, they also have an excellent assortment of wagons. We found the TimberRidge Folding Cart to be the best beach cart with big wheels that we tested – earning our Top Pick honor. This spacious beach cart is made of strong 600D polyester applied to fabric and measures 35x19x37 inches. What we liked about this versatile beach cart is its ease-of-use and durability. No assembly is required to set up the wagon. When you arrive at the beach, the cart opens from its folded state in mere seconds. A telescoping handle provides easy control of the cart in nearly any terrain. The sturdy frame and oversized wheels are able to support loads of up to 150 lbs. while remaining stable. Our next top choice for best beach carts with big wheels is the Rio Beach Wonder Wheeler Wide Beach Cart. What made this cart unique is its innovative design. Mimicking the same technology as an infant stroller, the Wonder Wheeler has large 10-inch wheels, an extended neoprene handle, and a full width back cover that provides extra durability. An embroidered back pocket provides easy storage access. 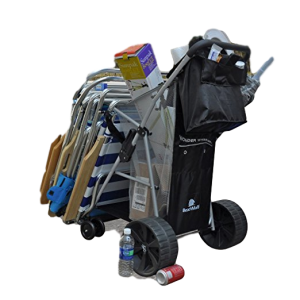 The all-terrain cart is a hassle-free way to carry all of your essential beach gear to and from the beach. Easily carry loads up to 100 lbs. with ease, while having sufficient room for a cooler, a beach umbrella, up to four beach chairs, and more. You’ll also find multiple storage areas, including a large mesh pouch, umbrella holder, removable tote bag, and a bottom rack and tray. What we like about this next beach cart is that it’s small, but powerful. The Wonder Wheeler Beach Cart features easy-to-roll ultra-wide wheels and a durable silver mist frame that can hold up to 77 lbs. What makes this one of the best beach carts with big wheels is that it doesn’t sink or plow into the sand. Simply push it through nearly any terrain with ease. Another great feature of the Wonder Wheeler cart is that it folds flat for easy storage. The pivoting front wheels turn easily, allowing you to maneuver through crowds without issue. While the cart weighs just under 13 lbs., it can easily hold a large cooler, up to four beach chairs, and other supplies in its spacious cargo area. 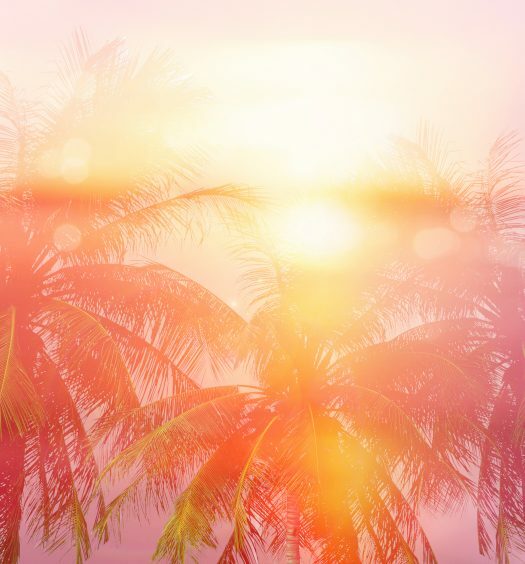 Use it at the beach, while camping, or for any outdoor events. With the right beach cart, it’s easy to pull along everything you need for a long day at the beach. 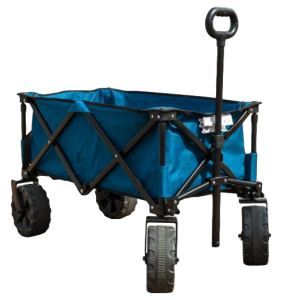 The Ultimate Premium Cargo Beach Cart by JGR Copa offers extra wide removable wheels which allow you to tackle all terrains without a problem. A convenient side umbrella sleeve keeps your beach umbrella secure. At the end of the day, the cart folds flat for easy storage. 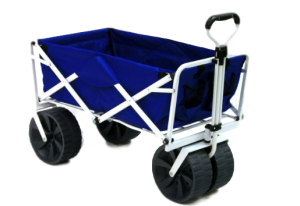 There are several key features that make this product one of the best beach carts with big wheels. 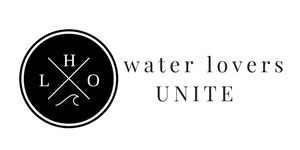 It’s lightweight, durable, and measures a spacious 38x25x31 inches. 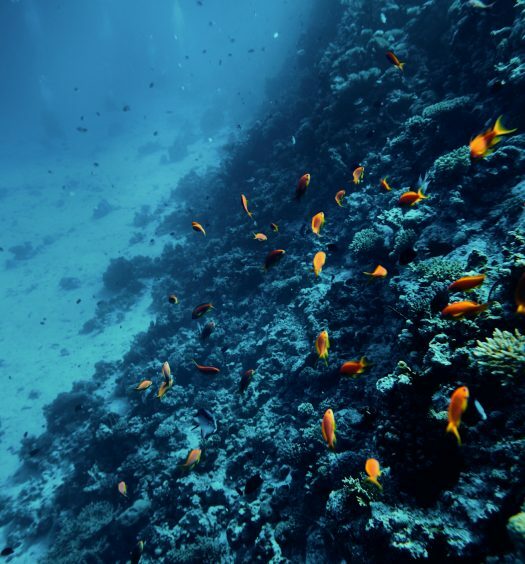 Easily store a wide range of beach supplies, including multiple beach chairs, a large cooler, beach toys, towels, and much more. With the Ultimate Premium Cargo Beach Cart, you can enjoy your day at the beach with everything you need in reach. Our last selection for the best beach carts with big wheels is the Mac Sports Heavy Duty Collapsible Folding All Terrain Utility Beach Wagon Cart. This high-quality wagon made our list due to its durable fabric, heavy duty frame, giant wheels, and ease-of-use. Its roomy interior opens up to a spacious 36.2 x 21.4 x 24.6 inches. No assembly is required and the wagon opens in seconds. With the ability to hold up to 150 lbs., users can bring along all of their beach gear with ease. 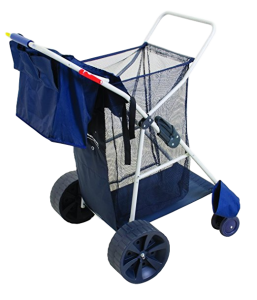 To make using your wagon even easier, you’ll find functional features like an adjustable handle, two mesh cups to keep your beverages secured, and extra-large wheels for transporting gear to the beach, park, concerts, outdoor sporting events, and any other occasion you see fit.